The Fund’s volatility is 20% below the NASDAQ Biotech Index (NBI) volatility of 33%. Significantly, the NBI is heavily weighted in mature, typically less volatile large-cap companies, with the Top 5 companies accounting for 38% weight, and the Top 10 accounting for 60% weight. The Fund’s volatility is 47% below the volatility of the TSX Healthcare Index of 40%. 100 Day Volatility of the Next Edge Bio-Tech Plus Fund (the “Fund”) Class A1 Units from inception on Feb. 17, 2015 to May 27, 2016. 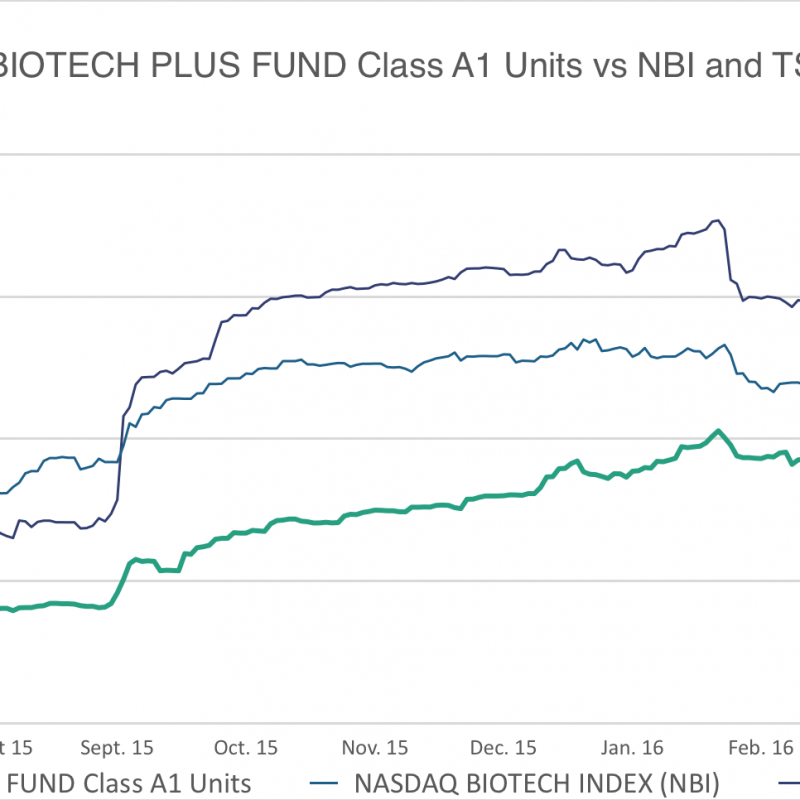 Nasdaq BioTech Index and the TSX Healthcare Index shown to represent a similar asset class. There are inherent limitations in any comparison between a managed portfolio and a passive index. Each index is unmanaged and does not incur management fees, transaction costs or other expenses associated with a managed portfolio. Capitalized terms not defined in this presentation are defined as set forth in the prospectus of the Fund (the ‘Prospectus’). This communication is not, and under no circumstances is to be construed as, an invitation to make an investment in the Fund nor does it constitute a public offering to sell the Fund or any other products described herein. Applications for the Fund will only be considered on the terms of the Prospectus. Each purchaser of the units (the ‘Units’) may have statutory or contractual rights of action under certain circumstances as disclosed in the Prospectus. Please review the provisions of the applicable securities legislation for particulars of these rights. Terms defined herein shall have the same meaning as in the Prospectus. Potential investors should note that alternative investments can involve significant risks and the value of an investment may go down as well as up. There is no guarantee of trading performance and past or projected performance is not indicative of future results. Investors should review the Prospectus in its entirety for a complete description of the Fund, its risks, and consult their registered dealers before making an investment.